Your first night in Fiji, you're apt to discover than Fijians have a thing for a not-altogether appealing drink called kava. They consider it their "national drink" and enjoy it religiously and with great ceremony for its mild sedative (some say euphoric) effect. As a visitor to Fiji, you will most likely be invited to try it yourself during a kava-drinking demonstration at your resort or during a visit to a local village. Here's what you need to know about this ancient ceremonial tradition. Kava, also known by its Fijian name yaqona, is an indigenous plant that has been long used by Pacific Island cultures for its pleasant relaxation effect. In the past, it was solely used by Fijian chiefs but is now enjoyed by everyone. It is still customary and good etiquette, however, to bring a small gift (sevusevu) of yaqona to give to the chief if you are invited to visit a local Fijian village. Kava is made from a pepper plant (piper methysticum) and only the root is used. It is first pounded into fine powder and then mixed into fresh water. The result looks a bit like muddy rainwater and the slightly bitter taste is more offensive than it is pleasant. Kava is drunk with great attention to detail in a formal setting known as a Kava Ceremony. Dress comfortably but modestly (no short dresses, exposed shoulders, or low necklines, and no hats). Participants sit cross-legged in a circle on the floor in front of the chief or head of the ceremony as he mixes the powdered kava root with water in a large wooden bowl called a tanoa (the root is strained through a cloth to keep out the grit). When the kava is ready, it is scooped into a bowl called a bilo (made from half a coconut shell) and passed to the first guest to drink. 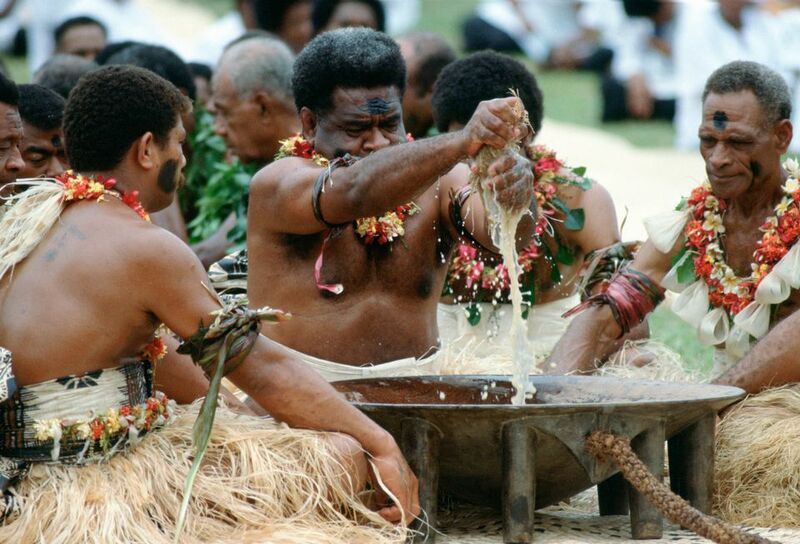 Turning down a bowl of kava is considered an insult to Fijians, so do try a bit. Kava made at your resort or during an organized tour to a local village with bottled or purified water is safe to drink. When it is your turn to drink, you should clap once, accept the bowl and drink it in a single gulp, and then clap again and say, "Bula!" As you hand back the bilo, you clap three times as everyone joins in. What Effect Will You Feel? Kava is said to have a pleasant, mind-clearing effect. After one cup you will begin to feel your lips and tongue tingle a bit as if your dentist had applied topical Novocain. If you like the effect, enjoy a few cups–supposedly there are no hangovers! You can purchase kava online from various sources. One of the best is Kava.com and is located in Vita, California. They offer kava from various islands in the South Pacific including Hawaii, Fiji, Vanuatu, the Solomon Islands, or elsewhere. Kava is also available from Amazon.com. Tahiti vs. Fiji: Which Is Right for You?